How many cats get three chances in this world? How many of those lucky cats is special enough to become a therapy cat? One regal silver-grey Korat named Jake has this distinction. After three unsuccessful adoptions, Fort Collins Cat Rescue didn’t give up on Jake. They saw his special skills and natural talents. Local newspapers and magazines have written about Jake. Animal Planet featured him on “Cats 101”. Now an entire book tells his story! 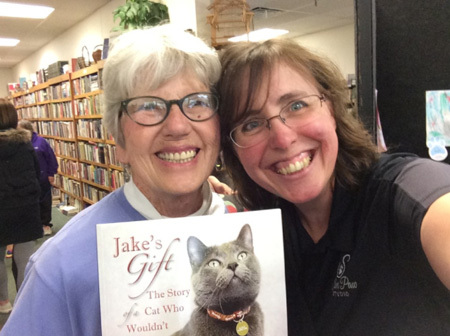 Author Pam Wolfe spent countless hours collecting stories and photos for her book, “Jake’s Gift. The Story of a Cat Who Wouldn’t Quit.” Told from Jake’s perspective she puts the reader inside the thoughts of a cat struggling to find his place in the world. Find out Jake’s whole journey and raise funds for Fort Collins Cat Rescue and Spay / Neuter Clinic. Books are available at FCCRSNC in Fort Collins or on Amazon.com.